← Louis P. Karol, Esq. 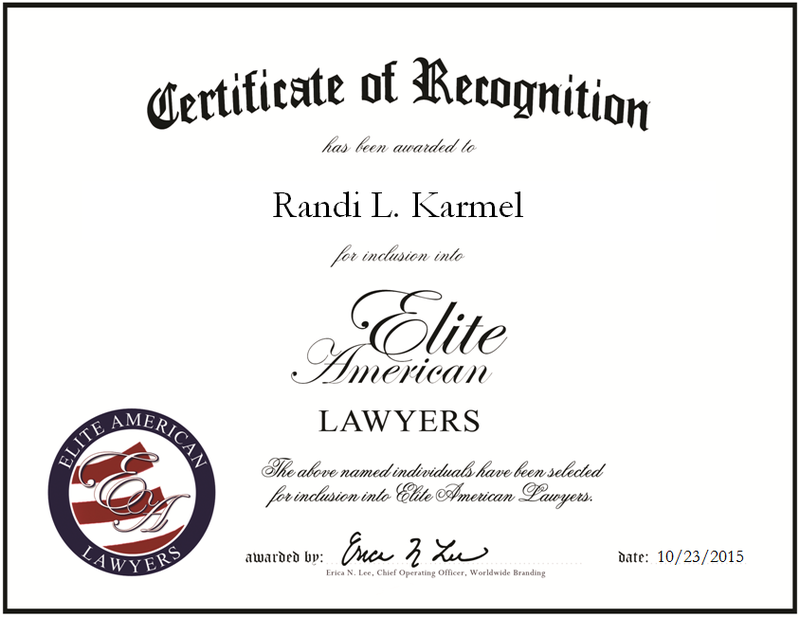 New York, NY, October 23, 2015, Randi Karmel, Attorney for Randi L. Karmel, PLLC, has been recognized by Elite American Lawyers, for dedication, achievement and leadership in family law. With her strong sense of right and wrong, Ms. Karmel felt it was only natural for her to enter the legal field. For more than a decade and a half, she has served as an attorney with an eponymous firm. Utilizing nearly 25 years of industry experience, she excels at representing her clients in family law cases. A member of the New York State Bar Association and the Brooklyn Bar Association, where she is a member of various committees, Ms. Karmel shines in her profession because of her prior industry experiences and her educational background, which includes a JD from the American University Washington College of Law. Throughout her career, she has been named one of the Top Attorneys in the New York Metro Area, as well as been given a Client Distinction Award. Due to her sincere passion for serving her clients, Ms. Karmel intends to grow into a larger role in the legal field. This entry was posted in Family Law and tagged child custody, divorce, family law, family law cases, legal services, matrimonial law, mediation, post-marital agreements, prenuptial agreements. Bookmark the permalink.